The pool at Macclesfield Leisure Centre is an eight lane short course (25 meter) pool. Lanes are divided between the swimmers based on ability. And because Macclesfield has eight lanes, it means that it is easy to cater for swimmers of all abilities, from adult improvers (lane 1) through to some very speedie competitive swimmers (lane 8). 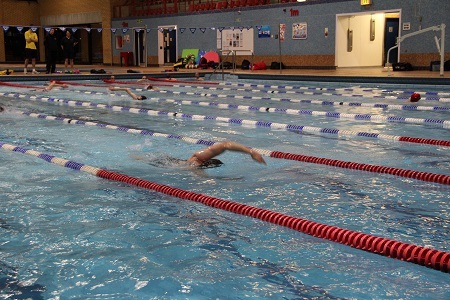 This 90 minute session is ideal for those swimmers who want to put a bit of “mileage” into their workouts. The lanes are structured according to ability. Sue provides a detailed plan specifically for this session. This is a 90 minute session, where for the first 30 minutes we share the pool – having exclusive access to three lanes. For the last hour, the club has full access to the pool, including for those who want to only swim for a single hour. The session is run as a full 90 minute session with Sue providing a plan for the total duration. For those that either cannot make the full 90 minutes, or prefer a less strenuous hour session, then from 21:00 on Friday we have access to all eight lanes. Again Sue provides a tailored plan to the 60 minutes. The sessions currently cost £5.00 and is payable at reception.